The US military is handing over leftover equipment from the Iraq conflict to police under a military surplus program. Civil liberties groups have criticized the initiative as unnecessary and a move toward the militarization of American law enforcement. American law enforcement agencies have received 165 MRAPs – 18 ton, armored vehicles with gun turrets – this year, according to an AP investigation. Military officials say police have filed requests for 731 more, but none are available. “It’s armored. It’s heavy. It’s intimidating. And it’s free,” Craig Apple, the sheriff of Albany County, told AP. 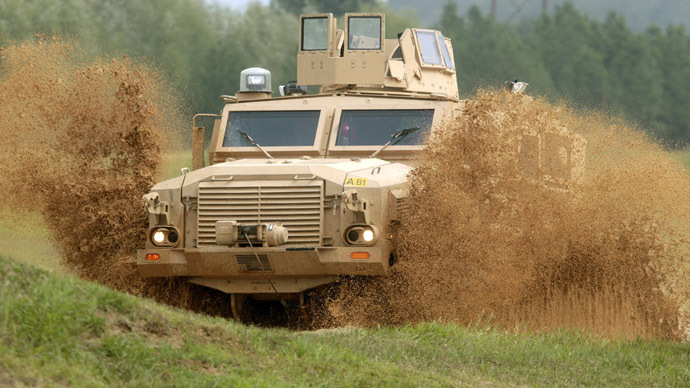 Each of the hulking military vehicles costs around $500,000, and before the MRAPs can be used by law enforcement agencies they have to be refitted for civilian use. Even after retro-fitting, the vehicles are still limited. Because of their size, the vehicles are unable to cross some bridges and travel on narrow roads. The investigation revealed that some of the MRAPs have already been put to use. In the city of Boise, Idaho, police deployed the vehicle because they suspected a suspect was in possession of heavy firearms and explosives. In Nampa, police used their MRAP to protect officers from a potential explosion. The distribution of the armored military vehicles to police forces has prompted strong opposition from US rights groups. The American Civil Liberties Union (ACLU) has attacked the military surplus program, branding it a move to militarize law enforcement. On its website, the NGO records examples of occasions when police have used military equipment in situations when it was unnecessary, disproportionate or counterproductive. In one such incident earlier this year, police in North Dakota used a $154 million MQ-9 Predator B drone to arrest a family of anti-government separatists who had refused to return six cows who had wandered onto their property to their owners. Local police borrowed the drone from the Department of Homeland Security, the ACLU reported. Apple, the Albany County sheriff, argued that the police force was not becoming more militarized and was instead preparing itself for every eventuality. “Our problem is we have to make sure we are prepared to respond to every type of crisis,” he said. For example, he said, if SWAT teams need to get close to a shooter or protect passers-by, a MRAP would be the vehicle for the job.